Given that Brazil has one of the most developed economies and coffee sectors throughout all of the coffee producing origins, its coffee producers and exporters are relatively "wealthy" in terms of resources and knowledge, placing them ahead of the curve when it comes to having the capacity to innovate in coffee production. About 80% of Brazilian coffee is natural processed. This is due to a few different factors, not least because labour is relatively expensive in Brazil. In general, labour costs combined with the fact that many farms have good infrastructure, coffee production in Brazil is more mechanized than it is in other producing origins. One potential paradox to this, when it comes to specialty coffee, is the value that is often placed on specialty coffee being handcrafted or otherwise produced in a special way. What we've found, over the years, is that it is not always the case that labour or time intensiveness equals coffee quality. Especially in Brazil, where we are continually impressed by the strides its specialty coffee community is making by using its relative wealth and resources to produce ever more interesting and more tasty coffees. Over the past few years in particular, we've noticed innovations in three areas: picking, processing and fermentation. In Brazil, coffee tends to be planted at "lower" elevations in comparison to other origins. This, in combination with the lack of manual labour, means that mechanical pickers are very commonly used to strip coffee cherries off of the trees. If undertaken only once in a season, farmers are left with a vast number of over- and under-ripe cherries, so in order to optimize the picking of ripe cherries, producers have come up with three levels of stripping: first from the top, then the middle, and finally the bottom of the tree. These pickings are further sorted into micro-lot and commodity grades. Interesting to note is that the middle of the tree tends to produce the best quality since it has the most balanced sun-exposure and the leaves protect the cherries from the elements (e.g. wind and frost). As well, while handpicking isn’t common, higher altitude farms or farms within mountainous areas require handpicking since machines aren't able to operate at these angles. Since Brazil is best known and equipped for producing naturals and pulped naturals, these processes are naturally the first to undergo experimentation and development. 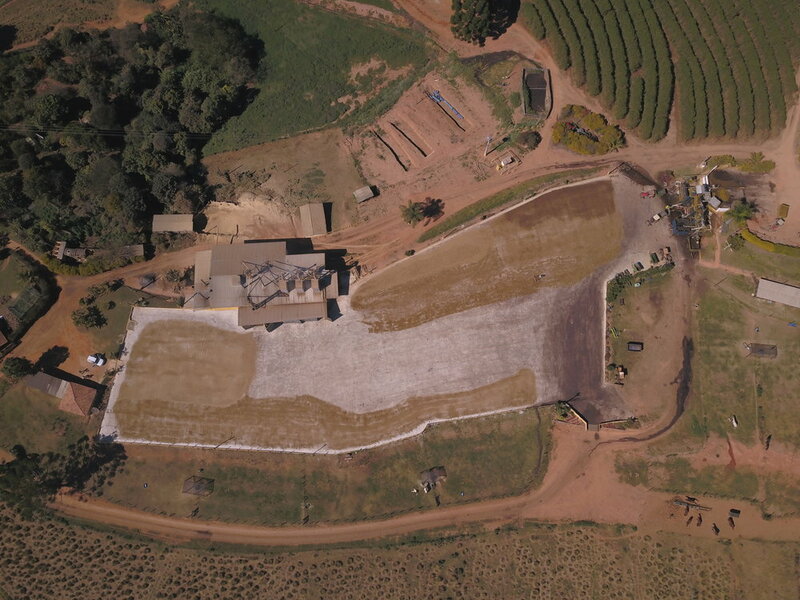 At higher elevation/small production farms, farmers are innovating the way they dry coffee since there is not a lot of room for drying beds or patios. Small huts with fermentation tank-like tanks with mesh floors are being built and solar panels are installed, which powers a turbine that creates warm or cold airflow based on drying needs. The drying method within these huts consists of first filling up the tank with five tons of cherries and then injecting a controlled amount of air flow upward through the mesh and on to the cherries. This whole process takes about 30 days to complete. According to Alex, who last travelled to Brazil for our August 2017 buying trip, while this process is slower than others, it provides a stable drying environment and temperatures. In terms of cup quality, he experienced that the coffee is quite fresh and fruit-forward. Carmo Coffees is both our longest-standing and most trusted partner in Brazil. They're also conducting some of the most forward-looking experiments in Brazilian specialty coffee. Within the area of processing, they are one of the few producers doing washed processing and for the first time, we are offering a washed Brazilian coffee that has been produced by them. We chose this lot not because it is a washed coffee, necessarily, but because it is really, really good. Carmo is also experimenting with yeast fermentation. Brazilian coffee producers in general haven’t had the energy or desire to ferment the coffee due to it being time and resource intensive. Brazil's coffee producing tradition has been focused on volume and uniformity. The times are changing and Carmo is at the forefront. While the Carmo team is choosing to be proprietary about the protocol of their fermentation experiments, the fact that they’re starting to experiment is itself significant. And already proving to be rewarding: one of the experimental lots last year was scored 93-points by no less than Kentaro Maruyama. What they were willing to share is that at one of the experimental farms, they had employed a yeast expert from France that had been traveling all over the world to teach producers how to use yeast in coffee fermentation. The basic concept is to utilize a single yeast bacterial culture within a stable tank/environment. This bacterial culture then lives in the tank and impacts the cherries in a way that is replicable year after year (since it's a single culture). The biggest upside is having replicable profiles year after year. Some downsides are that it pollutes water and is time consuming. Brazil is unique as a coffee origin because it has the land, infrastructure and capital to be freer in focusing on innovating, while most other origins are working just to make coffee a sustainable enterprise. In other words, Brazilian producers have the resources to carry out experiments and not just invest in disease prevention and other practical investments. Hopefully over time, as coffee markets and consumers become more educated about the costs involved in producing coffee and prices subsequently rise to meet these realities, the Brazilian approach to coffee innovation will become a model for other coffee origins to follow. Get in touch with Nico for samples if you are located in Europe & Asia and Sal if you are located in the US and Canada.